You know how it is when an idea starts nagging at you. 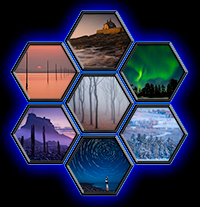 I’ve been thinking that I needed some new challenges and one that I have been looking at for a while is combining astro-photography with landscape. One place that had impressed me with it’s dark skies in the past was Anglesey with a shoot at Penmon Point sticking in my mind particularly. So with a new camera to hand but not much free time I set out having researched a few fresh locations for a 24 hour shoot starting with dawn at Treath Dulas. There are the hulls of couple of old fishing boats stranded on the mud of the estuary here and though I had hoped to photograph both of them, on the morning I could only gain access to the one closest to the shore. Dawn broke slowly but with not much colour but my day started well enough with this shot. Parys Mountain is an abandoned copper mine which did much for the prosperity of the island in the past but fell into disuse due to the falling price of metals on the World market. I had seen footage of the place on a TV documentary and had noted it as being worth a visit on my next trip into the area. There are a few promising ruins there but it was the extraordinary colours of the rock and spoil that caught my eye on this occasion. Normally I’m quite clear about the format of my compositions but this shot has me stumped. I really cannot decide which I prefer, the vertical or the horizontal shot. It seems to be a shot that divides opinions too. I have tested the image amongst friends and colleagues and the split seems pretty even. The other thing that seems about even is the number of people that see an animal head in the rock face and those that don’t. An interesting location that I think I will most likely visit again. Cutting across the island my next stop was Cribnau in Porth Cwyfan, best known as eglwys bach y mor (the little church in the sea). The small 13th-century church of St Cwyfan used to stand on the mainland but was slowly cut off by land erosion resulting in the building of the protective wall around it in the nineteenth century. There is a causeway leading to it at mid to low tide but I wanted to show it’s isolation by the rising waters which seems so central to it’s story. I used to struggle to find local tidal information for locations but these days computer programs and “apps” have made such information, along with astronomical and meteorological data, so much more straight forward to find. It really does make the life of a landscape photographer so much easier. I met a local lass on the beach that was diligently picking litter from the shoreline. Much of it comes in on the waves, the product of unthinking disposal at sea at it’s like is the blight of many of out beaches. Some of it is sadly left by visitors who really have no excuse for not taking it home with them. I have to say that this was one of the tidiest beaches I have seen in a very long time and I suspect mostly due to the hard work of this unsung hero. Three locations down and the main stop I had planned was another tidal island, Ynys Llanddwyn, just down the coast. I had arranged to meet on the island with Matt Aspden, another talented landscape photographer that I know from a local photographic society. He had visited the site before but it was all new to me on this trip. My plan was to stay overnight, shooting as the conditions allowed. The weather was supposed to be clear but cold. The wind was a little higher than I had hoped for but being on the coast you have to accept these things. When Matt arrived he had another good friend, Mike Lawrence in tow. They were only staying until sundown but the prospects looked good for all of us. The light clouds that had been with me all day looked to be clearing nicely. Having hiked in with a pack full of clothing to keep me warm I had to work in a fairly close area while there was still a lot of day trippers on the island but slowly they started to drift off as the light got more interesting. Eventually it was just us and a couple of other photographers waiting for the World to turn. More often than not, landscape photographers work around other like minded people, making sure we are not in each others line of shooting. This co-operation is helped by a friendly greeting and occasionally good conversation. Every now and again you come across the other type. Usually you can tell the sort, they obstinately stand in the same spot refusing to give ground as if they own the location, scowling at others that have the temerity to want to shoot the same landmark. Often they try to show their innate superiority by fiddling endlessly with a field camera that should only take a couple of minutes to set up. I used cameras like that back in the days of film and chemistry. In fact I still have a couple of them buried under my desk in the darkroom that has since been converted to a “lightroom” full of computers. These days I seem to achieve far more using digital technology than my old 5x4 or medium format film cameras ever could. It’s also a lot easier to carry around. Seeing this type of ill humoured photographer rather amuses me these days. Personally I have made a number of good friends, both professional and amateur, from meetings in places like this so I don’t really know what they expect to gain by it. Of the two other photographers present on this evening, one turned out to be a friendly chap from greater Manchester and the other, lugged his field camera off into the last light of sunset without saying a word. Later than that, at about the time the sun dipped below the horizon and twilight was beginning, Matt said that he would normally start packing to leave about now. I hope the pictures he got following that time will convince him to stay a bit longer in future. The only difficulty I had was picking my way off the rocks in the dark as I had foolishly left my torch in my rucksack which was tucked behind a rock some distance away and my eyes had not yet dark adapted. When Mike and Matt left I had the place all to myself and could start experimenting with the sparse light that remained long after the Sun’s influence had finally waned. Even here there was still light pollution from the mainland to the South, Holyhead to the North and a source I could not quite place out the sea. In the end there is little you can do about it so you might as well make use of it. The islands above were rendered entirely by the light from the stars and the light pollution and in the Milky Way shot it provided a useful splash of colour to silhouette the foreground. Later, as the moon rose over Snowdonia I tried this shot of the beach beneath the lighthouse. Of all the shots I took overnight this is the only one that is let down by noise. There is a slight banding in the sky that I cannot remove and sadly the shot you see here is probably the largest useful size I can get from it. To complete my night I was treated to a lovely mellow sunrise with the last quarter moon hanging gently over the far horizon. All in all a very productive 24 hours.